Sarah Meade has transformed her former elegant Westbound into the new cocktail haven Here and Now in the Arts District. She's partnering with Va'La Hospitality's Aaron Melendrez (Salazar), Damian Diaz and Othon Nolasco (E.R.B.). The cocktail menu is broken into five sections representing significant eras in L.A's history, featuring the likes of the "San Gabriel" (Avua Prata cachaca, Italicus, Chareau, kiwi and lime). Executive chef Geo Delgado (Gusto, Petit Ermitage Hotel) creates a chic bar menu featuring pork belly fries with Kennebec potatoes; a mushroom polenta with maitake, oyster and porcini mushrooms with a 63 degree egg and crispy Brussels sprouts; and, of course, a burger, made with a blend of short rib, chuck and brisket. Here and Now, 300 S. Santa Fe Ave., Los Angeles, CA 90013, 213-262-9291. 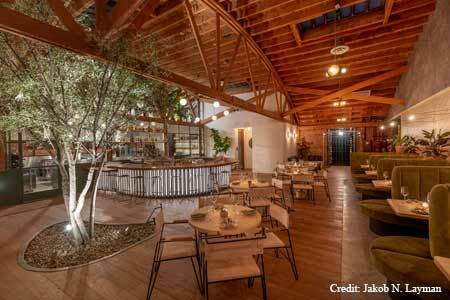 Veteran LA restaurateurs Beau Laughlin and Jay Milliken (Kettle Black, Sawyer) have opened a new Los Feliz restaurant, Atrium, on Vermont Avenue. The former theatre rehearsal studio space has become a sprawling, casual 3,200-square-foot eatery with an open, modern aesthetic that incorporates wood, skylights, and inherited brick and bolt accents. An experienced F&B team includes executive chef-partner Hunter Pritchett (Son of a Gun, Waterloo & City), pastry chef-partner Gregory Baumgartner (71Above, E.P. & L.P.), beverage director Jordan Young (Kettle Black, Sawyer) and general manager Cameron Dodge White (Little Dom’s). Look for a globally inspired menu that features oysters with Negroni mignonette; crispy maitake mushrooms with an eel sauce glaze; Hawaiian kanpachi crudo with nuoc cham, passion fruit, chiles, onion and viet herbs; and a Patchamama pork chop katsu with burnt apple bulldog sauce, cabbage slaw, lime, shiso and milk bread. Atrium, 1816A N. Vermont Ave., Los Angeles, CA 90027, 323-607-6944. Japan’s celebrated ramen restaurant Ippudo has opened its first Southern California location in Santa Monica in the former Taberna Arros y Vi space on 2nd Street. Ippudo, 1403 2nd St., Santa Monica, CA 90401, no phone. 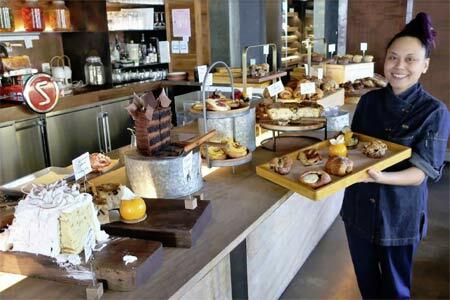 Tesse in West Hollywood now features brunch on Saturday and Sunday from 11 a.m. to 3 p.m. Enjoy French-inspired dishes from chef Raphaël François, along with croissants, muffins and more from pastry chef Sally Camacho Mueller. Check out GAYOT's photos and videos from Tesse's brunch. Tesse, 8500 Sunset Blvd., West Hollywood, CA 90069, 310-360-3866. Restauration in Long Beach is temporarily closed due to fire damage. Restauration, 2708 E. 4th St., Long Beach, CA 90814, 562-439-8822.